On this day in history, 12 October 1537, at two a.m. the future king Edward VI was born at Hampton Court Palace. Hugh Latimer, bishop of Worcester, greeted the news of the birth of the prince with joy, 'whom we hungered for so long'. The country at large shared his joy, and there were glorious celebrations across England. Edward was the only child of Henry VIII by his third wife, Jane Seymour. After twenty-eight years on the throne, Henry VIII finally had a male heir, and he had reason to believe that the Tudor succession was finally secure after years of uncertainty, bloodshed and religious revolution. Above: Edward's parents, Henry VIII of England and his third wife Jane Seymour. The queen's birth had been difficult, lasting two days and three nights. Three days after the birth, the prince was christened, although, as was the custom, neither the king nor his wife attended. Contrary to popular belief, Queen Jane seems to have recovered quickly, and was soon up writing letters and receiving visitors. However, the queen soon contracted an infection and she died nine days after the birth, aged twenty-nine. The king's euphoria and relief turned to sorrow at the loss of his dear consort. It cannot be overstated how relieved the king was at the birth of his son. When he had married Katherine of Aragon, his first wife, in 1509, he would surely not have foreseen that it would be almost thirty years before his much-desired son was born. This isn't completely true, for Katherine had given birth to three sons: Prince Henry, who lived for fifty-two days before dying in February 1511; a son in the autumn of 1513; and a son the following year, both of whom died. 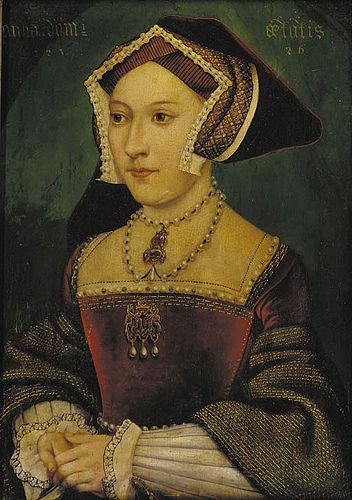 Katherine's marriage was annulled largely because it did not provide a male heir, and Henry married her attendant Anne Boleyn in 1533. Although Queen Anne gave birth to arguably England's greatest monarch, the future Elizabeth I, that year, she too, as with her predecessor, did not give birth to a living son. Most tragically, in January 1536 she gave birth to a stillborn son. Four months later, she was decapitated for treason. When Henry VIII married Jane in May 1536, he was almost forty-five, and from his point of view the succession was no more secure than it had been at his accession twenty-seven years earlier (although his previous wives had both given birth to a daughter). There is evidence that, when the new queen failed to conceive soon after her marriage, the king began voicing his doubts. Luckily for Jane, in early 1537 she became pregnant. Her condition was visible throughout the summer of 1537 and in September she arrived at Hampton Court for her lying-in where, a month later, she gave birth to a prince who, unlike those born to Katherine or Anne, survived. Above: Henry VIII with his son, Edward (left), and third wife Jane (right), c. 1545. In reality, Jane had been dead for eight years when this painting was completed. The king was, at the time, married to his sixth and final wife, Katherine Parr. The painting has been interpreted as a brilliant work of Tudor propaganda.